Recently, we have seen Creative streamlining their MP3 players to just Zen Stone and the newly released credit-sized ZEN which is a successor for the very popular Zen Vision M. The hard disk based Zen Vision M is low-margin product and thus they have given up on producing any hard disk MP3 player and replaced it with flash based MP3 player. The limitation however is that the highest capacity offered now for a flash based player is only 16GB. Creative drives this new opportunity to meet a strong demand from music lovers. Creative, a worldwide leader in digital entertainment products, is driving a new business opportunity for the CE and IT retail channels. The growing use of PCs for music listening is creating a new and growing market for stereo desktop speakers. Creative is driving this new market trend with the introduction of high-quality two-piece (2.0) speakers specifically designed for PC music listening. Two-piece stereo speakers have always been the music lover's choice, however, in the PC segment this solution has traditionally had a reputation of being ‘entry-level'. 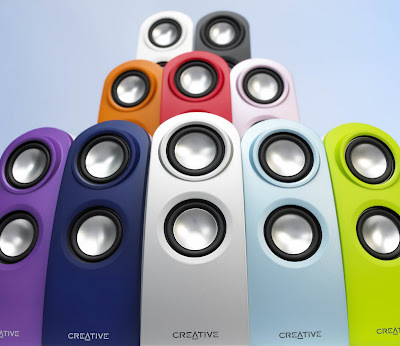 Creative has now designed a range of two-piece speakers which incorporate new technology solutions and hi-fi design principles such as BasXPort™ for enhanced bass, separate drivers (midrange and tweeters) and MTM (midrange-tweeter-midrange) configuration to deliver a better music listening experience on PCs and MP3 players alike. The growth of the market for music is impressive. According to the Consumer Electronics Association (CEA) of the US1 the percentage of online adults in the US who listen to audio via a PC grew from 34 percent to 72 percent between 2005 and 2007, more than doubling to a total of some 122 million people - and still growing! Music is the most universal type of content and 77 percent of home PC audio users listen to music for an average of nine hours a week. Most home PC audio listeners (79 percent) connect to a pair of speakers and more than a third (36 percent) would like better sound quality. Complementary data from IDC2 suggest that as a percentage of the world's paid online music service users, the US will fall from 66.9 percent to 38.7 between 2005 and 2010. The importance of these figures is that this apparent decline will in fact be caused by a surge in demand elsewhere in the world - and this has important implications for the European market. “We are seeing a strategic convergence of favourable trends,” comments John Keybeck. “On the hardware side, notebook PC sales continue to grow. Meanwhile, PCs as a whole are assuming truly significant importance in the global market for online music distribution and sales. “Put these facts together and you can see that there's a huge market for speakers that gives these music lovers the results they want in a simple, convenient desktop format. That's why we are responding to this market demand and designing two-piece speakers with innovative technology and hi-fi design techniques ensuring a quality music listening experience for the end user,” he concludes. GigaWorks T40 stereo speakers deliver fantastic audio! Using premium components, they combine high-performance mid-range drivers with dedicated high-end tweeters and BasXPort technology. BasXPort is designed to deliver enhanced bass, giving a fuller and richer sound. GigaWorks T40s use three drivers in MTM (midrange-tweeter-midrange) configuration. This is an advanced design that delivers improved spectral balance for improved directivity. GigaWorks T40s give a spacious, stable and balanced 2.0 performance that's perfect for music listening on PCs and MP3 players. GigaWorks T20 speakers are stylish and elegant two-way desktop stereo speakers. They include high-end tweeters and mid-range drivers for intimate, detailed highs and rich, immersive mid-tones, with Creative's BasXPort™ technology for enhanced bass. Inspire T10 speakers are the smallest speakers in the family. Combining BasXPort for enhanced bass, separate tweeters for high-end perfection and precision drivers for accurate mid-tones, they may be small - but don't underestimate their sound delivery!